I’m fortunate to have met many people through my fishing, many friendships forged on the beach have transcended into my normal day to day life. Two such friends Anthony Morris, aka Squiliam and Stephen Drumm aka Bummer are both part of some of my best fishing memories. I could write a book on the antics and adventures but one trip in particular sticks in my mind. 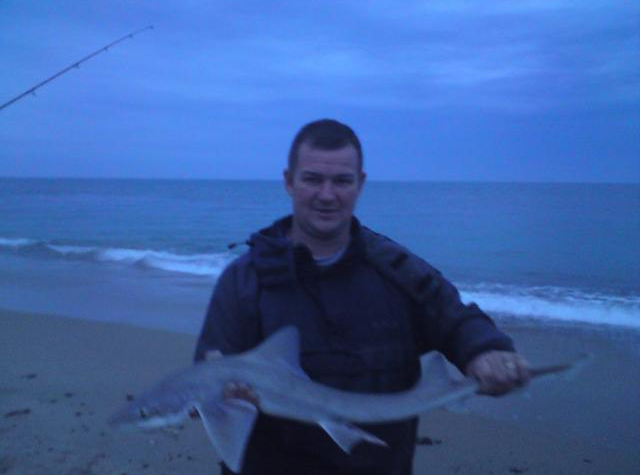 It was the summer of 2010, the fishing and weather had been good with lots of smoothound and bass showing, so we planned a night session on a beach South of Courtown, Co.Wexford called Old bawn. The three of us love our fishing but we also love our grub too, so I asked the lads to call to my house a few hours before we needed to leave and we had a massive barbecue. Burgers, steaks, ribs and sausages were all on the menu with no need for salads or potatoes, basically anything that didn’t contain meat wasn’t considered, being the carnivores that we are. So after a good feed and the usual banter and chat we hit the road to Wexford full of hope for a good evenings fishing. Anyone that has fished Old Bawn will tell you of the sand dunes that you need to hike over to get to the beach, Heart attack hill is the nickname many give it, and after a lot of huffing and puffing we got onto the beach and after a quick sit down to recover from the hike we were soon set up and fishing. Conditions were pretty much perfect, a light westerly wind was at our backs, giving our cast an extra few yards and we were fishing a rising spring tide, with high water at twelve am, which from experience was the best stage of tide to fish this beach. 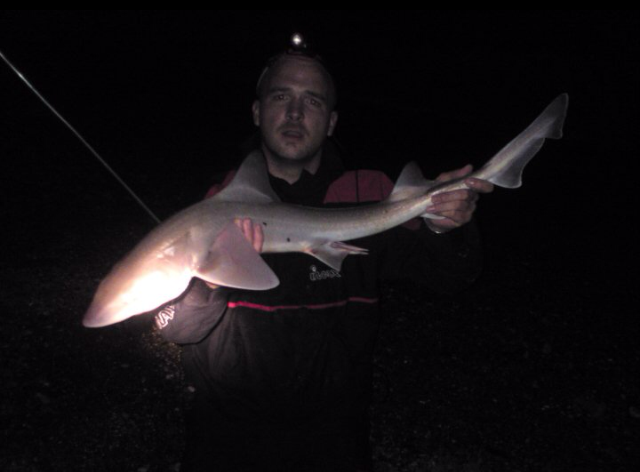 Tactics were pretty much all the same between the 3 of us, flappers in close baited with Lugworm for the bass and flat fish, then fresh crab on pulley rigs at distance for the smoothound. It wasn’t long until the fish at distance started honing in on the prime crab baits and were hitting the rods hard, some bites pulling the rod clean off the stand if you didn’t have your drag set correctly. These hard hitting, beautiful fish were smoothound, belonging to the shark family. Smoothound are a great fish to catch, they hit hard and fight even harder, especially when they get into the shallow water of a beach. They arrive on the east coast beaches around May and can stay as late as October. The best bait by a mile is peeler crab long we all had five or six fish each, ranging in weight from a couple of pounds up to some better fish nudging the seven pound mark. 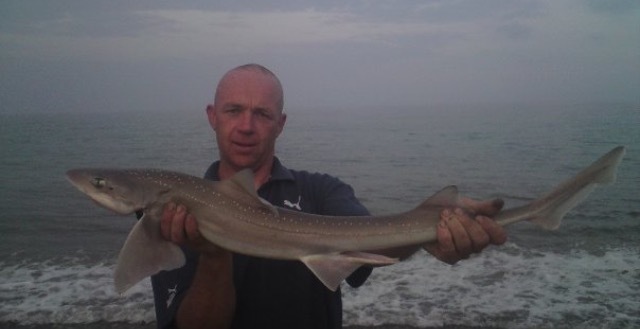 Stephen is a bit of a hound expert having caught many double figure fish from the shore in previous years, with some of his best sessions coming on the famous Clones strand in Wexford, a one time Mecca for smoothound anglers. As the last light faded so did the hounds, as so often they do when darkness sets in, it was then our attention turned to the bass. The baits we had been fishing in close during daylight were picking up flounders and dabs, but once sun disappeared over the horizon the bass stared to feed. Bass are known as a fish that feed quite close to shore often nearly under your nose, so most casts were just a flick out into the surf. We didn’t have to wait long until the bass started to take interest in our lug baits. 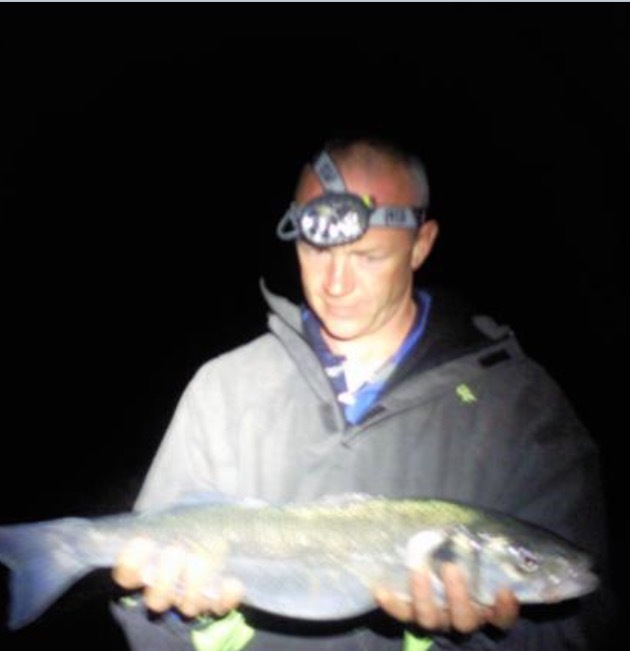 I was first into a fish probably about four pounds in weight, followed soon after by a fine fish for Anthony, who by this stage was only recovering from a dash back up and down heart attack hill to get his headlight that be had left in his van. 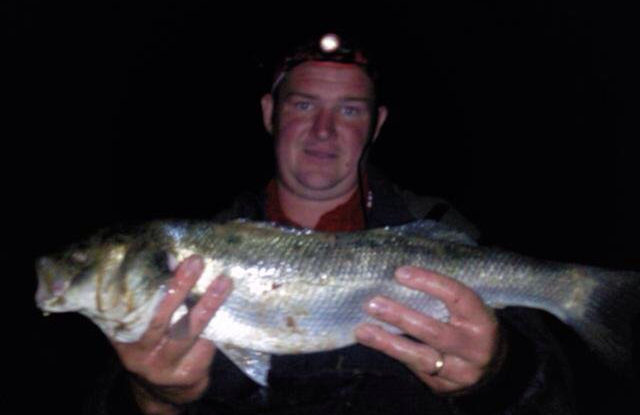 This continued for around an hour with bass ranging from around two pound up to around six pound. We all had fish and we each kept a couple each to bring home for dinner the next day. Lug was by far the best bait on that evening with a few fish also falling to crab. So after a great day of eating and fishing we left the beach around two am, content after a successful session, even the hike back over heart attack hill and the drive home didn’t seem as bad as earlier. These days I don’t fish with the lads as much, Anthony now lives in Lithuania and Stephen is more interested in chasing women than fishing but I am in constant contact with both of them and we all remain good friends brought together by fishing. But we still get out when we can and another great trip to Cork also springs to mind but I think that’s a story for another day. This entry was posted in Shore fishing and tagged Shane O Dea. Bookmark the permalink.